A few exhibitions at Artist Run Initiatives in April 2010 – Kings ARI : Eliza Gregory “The Californian” & Jessi Imam “Bereft of the Corporeal” – Mailbox 141: Sally Tape and Candice Crammer “Now”. Eliza Gregory’s breezy series of photographs, “The Californian” are coolly exhibited on a band of fresh aqua blue painted walls, a very different feel to the usual white walls. The photographs have a relaxed personal mood but are carefully composed vignette portraits of her Californian family and friends. This is a parallel exhibition to Gregory’s, “The Local”, shown earlier this year at the Yarra Sculpture Gallery of people from Melbourne. Gregory is lightly examining her trans-Pacific identity. Like Eliza Gregory, I also have a trans-Pacific identity with a brother, niece and nephew living in California but I didn’t discover any great insights from the exhibition. It would have been good to see some but I doubt that they will be found in portraits of people. People are people where-ever they live; their identity is rarely about their appearance. Or perhaps the trans-Pacific identity has become too homogenized to be able to see differences. 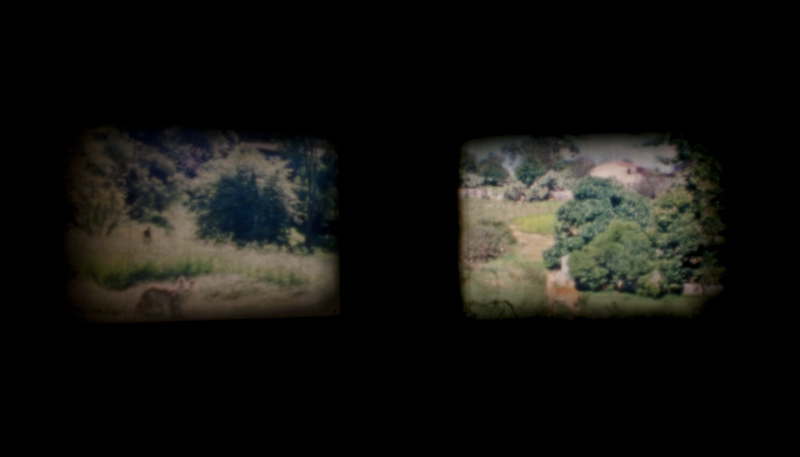 Jessie Imam’s installation, “Bereft of the Corporeal” is a triumph of the classic technique of Super 8 film loops. It is also the antithesis of motion picture technology as nothing moves in the installation except for the two loops of film going through the two Super 8 projectors and the dust on the two screens. The images on the film doesn’t move – the taxidermy coyote and an antelope stand in the alien habitat of a green suburban landscape. 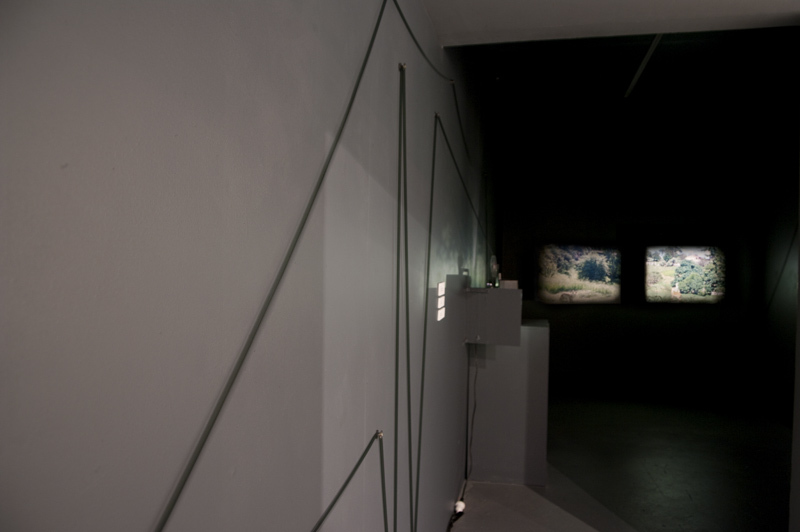 The two loops of film return to the projector after navigating around the wall of the gallery on 9-10 rollers, like many contemporary installations using string and nails to map out space. I almost missed the 3 birds nests of human hair in the installation, the space was so dark; they too are bereft of the corporeal, the body that they came from. Sally Tape and Candice Crammer’s “Now: I steal from work and I steal from You Tube” uses stolen images and stolen tape. Sally Tape, as her name suggests, has consistently used multiple rolls of commercial tape in her post-minimalist work, as well as, collaborating with other artists. In this exhibition Candice Crammer uses photographs in the mailbox like flip book frames using still images from a YouTube video “the funniest falls ever (I think)”. And Sally Tape adds lines of colored tape. Has anyone else seen these exhibitions?